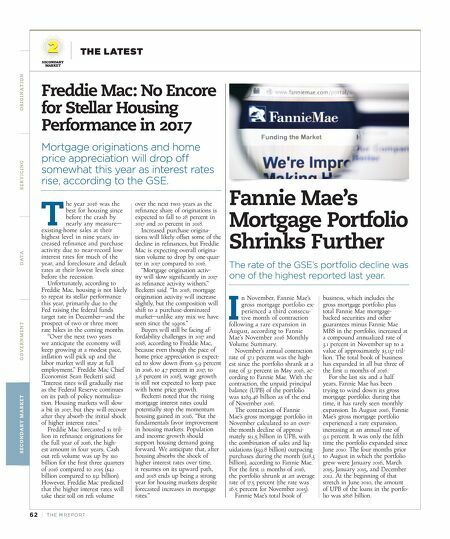 62 | TH E M R EP O RT SECONDARY MARKET THE LATEST O R I G I NAT I O N S E R V I C I N G DATA G O V E R N M E N T S E C O N DA R Y M A R K E T Freddie Mac: No Encore for Stellar Housing Performance in 2017 Mortgage originations and home price appreciation will drop off somewhat this year as interest rates rise, according to the GSE. T he year 2016 was the best for housing since before the crash by nearly any measure— existing-home sales at their highest level in nine years, in - creased refinance and purchase activity due to near-record low interest rates for much of the year, and foreclosure and default rates at their lowest levels since before the recession. Unfortunately, according to Freddie Mac, housing is not likely to repeat its stellar performance this year, primarily due to the Fed raising the federal funds target rate in December—and the prospect of two or three more rate hikes in the coming months. "Over the next two years we anticipate the economy will keep growing at a modest pace, inflation will pick up and the labor market will stay at full employment," Freddie Mac Chief Economist Sean Becketti said. "Interest rates will gradually rise as the Federal Reserve continues on its path of policy normaliza - tion. Housing markets will slow a bit in 2017, but they will recover after they absorb the initial shock of higher interest rates." Freddie Mac forecasted $1 tril - lion in refinance originations for the full year of 2016, the high- est amount in four years. Cash out refi volume was up by $10 billion for the first three quarters of 2016 compared to 2015 ($42 billion compared to $32 billion). However, Freddie Mac predicted that the higher interest rates will take their toll on refi volume over the next two years as the refinance share of originations is expected to fall to 28 percent in 2017 and 20 percent in 2018. Increased purchase origina- tions will likely offset some of the decline in refinances, but Freddie Mac is expecting overall origina- tion volume to drop by one-quar- ter in 2017 compared to 2016. "Mortgage origination activ- ity will slow significantly in 2017 as refinance activity withers," Becketti said. "In 2018, mortgage origination activity will increase slightly, but the composition will shift to a purchase-dominated market—unlike any mix we have seen since the 1990s." Buyers will still be facing af - fordability challenges in 2017 and 2018, according to Freddie Mac, because even though the pace of home price appreciation is expect- ed to slow down (from 5.9 percent in 2016, to 4.7 percent in 2017, to 3.8 percent in 2018), wage growth is still not expected to keep pace with home price growth. Becketti noted that the rising mortgage interest rates could potentially stop the momentum housing gained in 2016, "But the fundamentals favor improvement in housing markets. Population and income growth should support housing demand going forward. We anticipate that, after housing absorbs the shock of higher interest rates over time, it resumes on its upward path, and 2018 ends up being a strong year for housing markets despite forecasted increases in mortgage rates." Fannie Mae's Mortgage Portfolio Shrinks Further The rate of the GSE's portfolio decline was one of the highest reported last year. I n November, Fannie Mae's gross mortgage portfolio ex- perienced a third consecu- tive month of contraction following a rare expansion in August, according to Fannie Mae's November 2016 Monthly Volume Summary. November's annual contraction rate of 37.1 percent was the high - est since the portfolio shrank at a rate of 32 percent in May 2016, ac- cording to Fannie Mae. With the contraction, the unpaid principal balance (UPB) of the portfolio was $289.46 billion as of the end of November 2016. The contraction of Fannie Mae's gross mortgage portfolio in November calculated to an over- the-month decline of approxi - mately $11.5 billion in UPB, with the combination of sales and liq- uidations ($39.8 billion) outpacing purchases during the month ($28.3 billion), according to Fannie Mae. For the first 11 months of 2016, the portfolio shrunk at an average rate of 17.5 percent (the rate was 16.5 percent for November 2015). Fannie Mae's total book of business, which includes the gross mortgage portfolio plus total Fannie Mae mortgage- backed securities and other guarantees minus Fannie Mae MBS in the portfolio, increased at a compound annualized rate of 3.1 percent in November up to a value of approximately $3.137 tril - lion. The total book of business has expanded in all but three of the first 11 months of 2016. For the last six and a half years, Fannie Mae has been trying to wind down its gross mortgage portfolio; during that time, it has rarely seen monthly expansion. In August 2016, Fannie Mae's gross mortgage portfolio experienced a rare expansion, increasing at an annual rate of 9.1 percent. It was only the fifth time the portfolio expanded since June 2010. The four months prior to August in which the portfolio grew were January 2016, March 2015, January 2015, and December 2012. At the beginning of that stretch in June 2010, the amount of UPB of the loans in the portfo - lio was $818 billion.